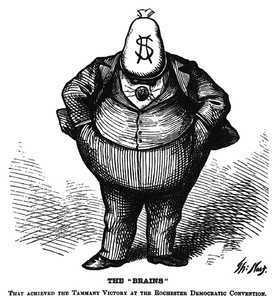 The "Brains": Thomas Nast cartoon of Boss Tweed. Yet it has become fashionable in some circles to deem ANY cartoon representation of Muhammad automatically to be in bad taste. That becomes a justification for failing to print any such cartoon, no matter how incisive or newsworthy. Garry Trudeau adopted this logic in his critique of Charlie Hebdo. Sadly, many PEN members followed suit. The New York Times implicitly accepted that some Muhammad cartoons could be in good taste when its editor commented, "We have a standard that is long held and that serves us well: that there is a line between gratuitous insult and satire. Most of these [Charlie Hebdo cartoons] are gratuitous insult." But even though "most" is not "all," the Times did not find EVEN ONE Charlie Hebdo cartoon newsworthy in the wake of the massacre, to the consternation of its ombudsman. Its actions imply that in reality there is no distinction between good taste and bad taste cartoons of Muhammad. "Ultimately," explained the ombudsman, the editor "decided against it, he said, because he had to consider foremost the sensibilities of Times readers, especially its Muslim readers. To many of them, he said, depictions of the prophet Muhammad are sacrilegious; those that are meant to mock even more so." Clearly, ALL pictures of Muhammad are proscribed under this heckler's veto, NOT ONLY "those that are meant to mock." Of course, the Times' concern over insulting the sensibilities of its readers did not stop it from reprinting The Holy Virgin Mary painting, in which Mary is portrayed covered in elephant dung. In reality, its deep concern about reader sensibility only surfaces where offended readers may murder news editors, reporters, etc. But rather than admit that it is acting out of fear, the Times offers another rationale: nice people don't publish cartoons of Muhammad. The end result is to shut down an extremely effective tool for illustrating the problems of Islam as it grapples with a radical ideology fighting to take it over. All of us who don't see "them damn pictures" are the poorer for it.